Harold Smith in World War II uniform. BUXTON — Harold Smith, 96, is likely the sole survivor of a Westbrook-based company of World War II soldiers. Smith, a Buxton native, was a member of Company D in the 103rd Infantry Regiment of the Maine National Guard. The foot soldiers fought in Pacific Theater jungles in World War II. “I may be the last one,” Smith said last week. He said “all things indicate” he’s the last one alive from the company, if not the regiment. “I’d like to hear from anybody,” he said. 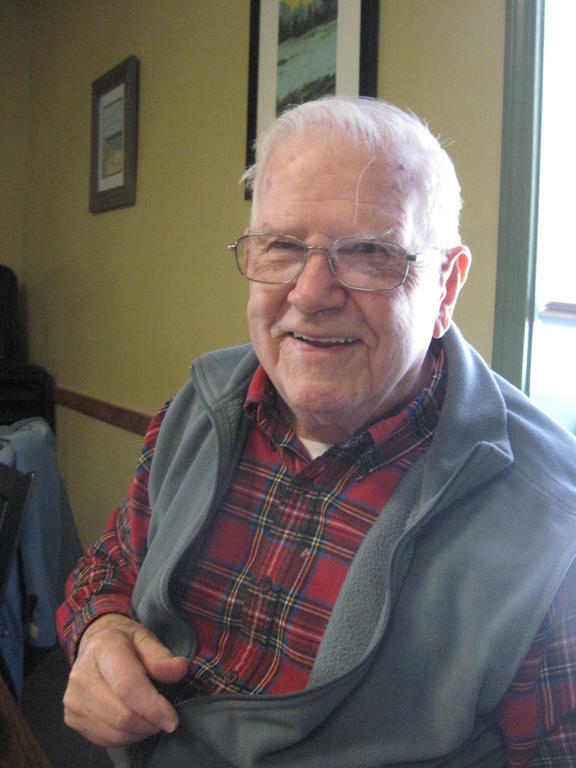 Smith was born Sept. 14, 1922, in Buxton and grew up on Long Plains Road, north of Buxton Center. Now, 10 years a widower, he lives with his daughter Rebecca Smith on the same road. He has a son, Jim, in Connecticut, and a grandson. He was reared in Buxton during the Great Depression. During his early school years, he lived with his grandparents because it was a shorter walk to a one-room school from their house. His grandparents did not have indoor plumbing, a radio or even electricity. “I was wood and water boy for my grandparents,” Smith said. Graduating Buxton High School in 1939, he hitched up with Company D headquartered at American Legion Post 62 in Westbrook. Work was scarce and Smith said he enlisted hoping to get a bead on a local job. “We always had farm work, but I wanted to do something different,” he said. After joining the outfit, he rode with a friend to drills. The company included soldiers from Buxton, Baldwin, Gorham and Westbrook. He was a private earning $30 a month and sent an allotment to his mother. “Food was scarce at home,” he said. According to a Company D diary, the day after the attack on Pearl Harbor the soldiers gathered on a Florida parade field to hear President Franklin D. Roosevelt’s speech. Smith sailed Oct. 1, 1942, aboard a troop ship for the Pacific. The 103rd Infantry Regiment saw action in battles including Guadalcanal. The regiment’s mostly Maine soldiers were augmented with replacements from several states. Company D suffered battle casualities. Westbrook men wounded in action included Pfc. Rudolphe Lebel, Sgt. Roger Aucoin, Sgt. Roland Bernier, Sgt. Albert Goyet, and Pfc. Eugene Landry, according to diary information. Each Company D soldier was decorated with the Combat Infantry Badge and Bronze Star, the diary said. Christmas twice proved memorable. According to the regiment’s diary, extra rations issued on that day in 1943 included six bottles of beer for each soldier, their first beer since November 1942 in New Zealand. Rotated stateside from deployment, he sailed under the Golden Gate Bridge on Christmas 1944 and was discharged a corporal in August 1945. On the homefront, Smith became postmaster in the West Buxton Office, the last man appointed to that job by President Harry Truman before the appointment procedure changed. Smith retired from the post. He can be contacted at 727-3449 or by mail at 553 Long Plains Road, Buxton, Maine, 04093.